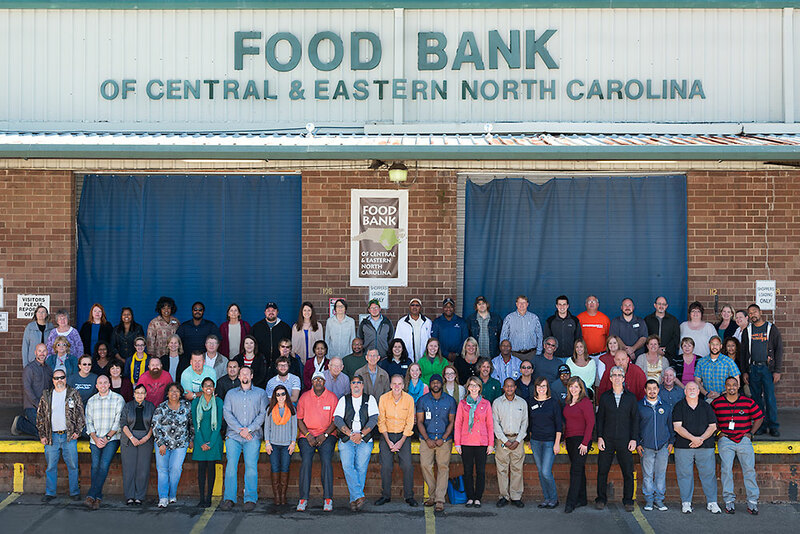 The Food Bank family at our Raleigh Branch. Established in 1980, the Food Bank of Central & Eastern North Carolina is a nonprofit organization that has provided food for people at risk of hunger in our 34 county service area for over 30 years. The Food Bank serves a network of more than 800 partner agencies such as soup kitchens, food pantries, shelters, and programs for children and adults through 6 branches in Durham, Greenville, New Bern, Raleigh, Sandhills (Southern Pines) and Wilmington. Learn more by visiting our website. Sadly, hunger remains a serious problem in central and eastern North Carolina. In the counties we serve, more than 651,000 people are food insecure and struggle with hunger every day. 1 in 3 of the people served by the Food Bank’s network are children. Learn more about the area we serve by viewing our 34 county profile page. The Food Bank collects and distributes food to local hunger relief charities. (We call them partner agencies.) Our partner agencies then provide the food to those in need, whether it be in the form of a bag of groceries or a warm meal. Last year, the Food Bank distributed 53.6 million pounds of food and non-food essentials through our partner agencies, including 16.5 million pounds of fresh, nutritious produce, equating to about 45 million meals provided to families in need. The Food Bank Blog is a source of information for our partners, providing a more in-depth view of the work of the Food Bank, the people we serve, and resources for providing hunger relief to those in our communities. The primary goal of the Food Bank Blog is to strengthen the conversation around hunger, to share more information with you, and to empower you with the knowledge that will not only keep you connected to the Food Bank, but will allow you to work with us in our mission that No One Goes Hungry in Central & Eastern North Carolina.